My mom warned me about this. At the time, I totally ignored the warning and, instead, got that intense, tingly, I-can’t-wait-to-be-a-mother feeling that overcomes women of childbearing age upon hearing warnings like this so as to ensure our species lives on. 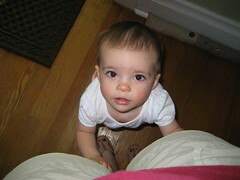 She can’t yet hang on while I walk (which I hear is coming). So usually I explain to her that she’s going to have to wait. I unclasp her hands from my legs, put her on the floor and surround her with 10 toys, 12 books, a sippy cup and Cheerios—sometimes I even call Tucker for further entertainment. The child is fast. I swear, not five seconds go by and she’s flung all her “entertainment” across the room and she’s clutching my knee acting as if her very world is collapsing (and, to be fair, in her limited life experience, it probably feels like it is—I mean, when the worst part of your day is being thirsty and not being able to express it or having to go through yet another diaper change, the minor must seem quite major). And it’s hard. I don’t want to cater to her whining. But I also don’t think she’s quite old enough to understand “Sophie, don’t whine” yet. And I want her to know that when she’s lonely or sad or just wants some company that she should come to me. That’s why I’m her mom. That’s why I’m home. That’s why I fall for her pull-her-favorite-book-and-drag-it-over-to-me-so-I-can-pull-her-on-my-lap-and-read-it-to-her trick every time. And the knee clutch, if I’m really honest, is endearing, at times. But the whining … I know. I was warned. This entry was written by kara, posted on May 29, 2009 at 10:04 pm, filed under Uncategorized. Bookmark the permalink. Follow any comments here with the RSS feed for this post. Post a comment or leave a trackback: Trackback URL.